Founded in 2008 in St. Petersburg, the quintet apparently recorded this début album in 2010 but War and Peace was only released in 2015 with the help of the ArtBeat label. And what a release it is. Completely instrumental, the pieces, written by keyboardist Ulyana Gor and guitarist Oleg Gorgadze, are succinct, well thought out and dynamic, the result being an enthralling album of real variety. I’ve played it many times and it continues to impress, the arrangements allowing space for soloing but only where it benefits the music; there is no show-boating but everyone still gets a chance to really play. At less than an hour in length the band wisely avoid a work of Tolstoy proportions and convey the War and Peace theme (although the inspiration is not taken from Ol’ Leo’s masterpiece) through track titles which are vividly described in the music. Immediately apparent on opener Dilemma, the violin of Artem Gareev is centre-stage, giving an ‘Olde Worlde’ feel that is soon dissipated as the piece progresses. 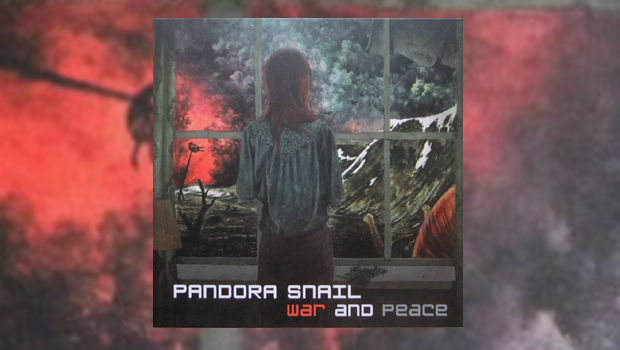 There is a dynamism to the music of Pandora Snail that sees them jump between sections with ease; driving rock, lyrical violin, ELP-style Hammond, synth solo, classical influences and jazz. I’m a sucker for the use of “traditional” wooden instruments and the warmth of the violin is key to the success of the album, and when coupled with Gor’s piano it is an irresistible combination. Throughout War and Peace the various movements are integrated with care and attention to detail, the players working well together in service of the writing which is of a high standard. These professional musicians clearly have wide-ranging experience in a number of styles and also show great enthusiasm for what they are trying to achieve. The mournful start to By The Mountain River expands into a beautifully realised melody, changes of tack bringing in upbeat piano and sweeping violin, a jazz feel never far away as the instruments play off each other. By far the longest track and the centrepiece of the album, James Pont sees the guitar buzzing around like an angry wasp in a jam jar before peace is returned via lilting violin. The use of violin on War and Peace is sublime and for anyone who enjoys the instrument in a rock setting (be it with Curved Air, Mahavishnu or numerous others) this album comes highly recommended. The guitar adds a nice edge, this track being a more angular listen than what might have been expected from the first few numbers. Another gorgeous duet from piano and violin brings things back to basics before building to a storming cacophony and fade. It’s extremely well put together, everyone contributes and the results are very interesting with the band gelling well as a whole. You get a sense that the album is growing in stature all the time as Pandora Snail show more of what they can do and Mother’s Tears is exquisitely beautiful, the elegiac feel carried on the sumptuous violin. Red Rivers is brief and to the point, a short, sharp shock of a piece, wonderfully arranged and delivered with the melody surfing over breakneck rhythms. Add some reggae and a picked guitar solo to Stones’ Names and it all becomes genuinely engaging, sweeping violin carrying all before it like a warm wind across the Steppes. Dance Under The Bullets is funky and strident, on the money for direction and delivery, while a brooding menace builds into a thumping storm on After The War, violin again sailing sweetly over the raging undercurrent. And that leads us to the culmination in Satori. It starts with a nod to Pachelbel’s Canon, reworked and re-imagined as a fitting introduction to the final piece of this exquisite album. From its initial inspiration it ranges widely, an enthralling journey that leaves you far from where you expected. Jaunty classical, folksy dance, powerful rock, jazzy asides – it’s all here. War and Peace is an album that improves as it goes along. It starts well but by the end it really has you, the band seem to improve in every element as you listen – and they aren’t bad to start with. It’s an uncanny effect that serves the album well as it moves from the pastoral to more sophisticated territories with ease in an eclectic storm of influence and inspiration. It’s a diverse listen that handsomely repays repeated plays, the variety of styles being successfully drawn into a cohesive whole with violin holding it all together. This is a feast of composition and ensemble performance.